It turns out Forecasting for SEO is time consuming and often inaccurate. However, SEO’s do spend a lot of time on it, because Forecasting appears to be crucial to increase investment. Last week we and Linkdex spoke to a group of SEO’s and did a survey here on State of Digital, to get an understanding of industry opinion on Forecasting for SEO. I am now happy to share with you what we learned. 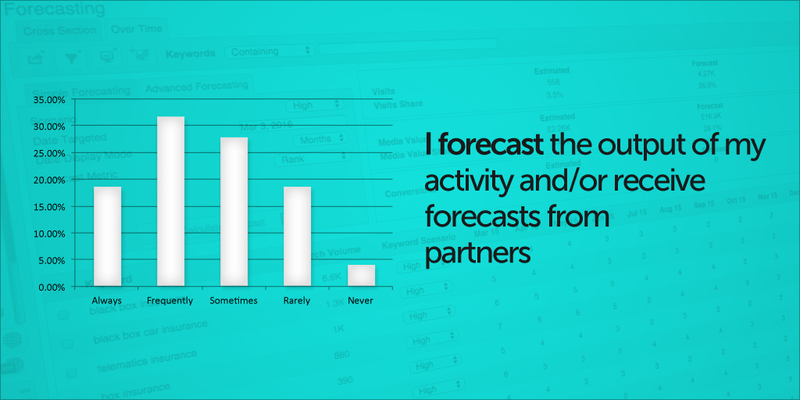 I knew that lots of people were spending lots of time forecasting, I also knew that with competitor activity, alongside all of the variables within the space, it was incredibly difficult to forecast accurately and I equally felt as though forecasting was becoming increasingly important to secure increased channel investment or win pitches. Fortunately, I was not alone. 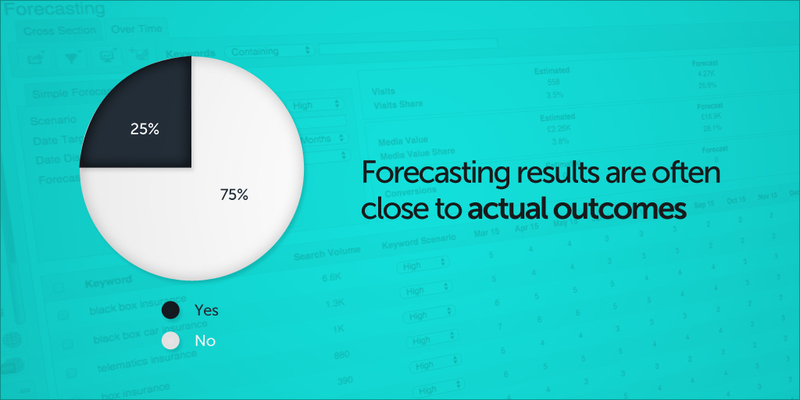 We discovered that 78% of the respondents (both agency and in-house SEOs across a range of levels) at least sometimes forecast SEO activity with a dedicated 18% always forecasting against activity. Interestingly, only 4% responded that they never forecast activity; a figure which, had I done this only a few years ago I imagine would have been much higher. With all of us forecasting away like Michael Fish the question remains…why? And are we good at it? It seems as though the reason we love to forecast is because we need to put our money where our mouths are, with 64% responding that financial decisions are affected by forecasts. (64% either agree or strongly agree that it’s critical to winning a pitch and 65% believe that detailed forecasting allows us to increase channel investments). Essentially, important financial decisions are being made based on our forecasts. Is it malapropos then, that only 1 in 4 felt as though forecast results were close to actual outcomes? That forecasting is difficult is no secret, (in fact 92% of those who answered the survey questions either agreed or strongly agreed that it is time consuming) of course it is. We’re operating in an industry where we’re optimising against thousands of ranking metrics which are constantly in flux, alongside all of our competitor activity, against ever changing ad formats and where every other piece of marketing activity, from TV to tradeshows, equally has an impact organic traffic. And I know I’m not the only one who has legitimately discussed the weather in a meeting about not hitting targets. Ultimately, we’re all in agreement that forecasting is crucial; both for internal goals and to justify investment. The new necessity for forecasting is symptomatic of an industry growing up and that makes me want to hug everyone who has ever optimised a title tag. We can make it easier, we can make it faster, we can continue to get better at it and learn from our not close to actual outcomes, however it will never be completely accurate; and we like it that way, because the fact that we operate in such an ever changing, multi touch, multi discipline channel is why we bloody love it. We didn’t just do a survey, we also talked to several different experts in the industry, amongst which several State of Digital bloggers, we will share their thoughts in a different post later. For now we are very interested in your ideas: is Forecasting worth it for you? Let us know in the comments or on Twitter! I work client side, and I’ll say this – being bad at forecasting is not an excuse not to do it. This is a costly business, both in paying an agency and in internal developement time, and if someone cannot give me an idea of the effect of some work then I assume they are either too inexperienced to be trusted or they themselves lack faith in what they are proposing. This standard applies everywhere across business and there’s no reason why organic practitioners should be different. The converse is true as well – if I’m an agency and I’ve got a good track record of being able to forecast and deliver, I’m calling up all of these clients and asking them to give me testimonials around that. Trust is valuable. Part of our KPI set is this years traffic (visitors) compared to last years. We forecast this years traffic with a mark-up calculated from our content strategy plan. Forecasting have been proven difficult, however, since we implemented a content strategie plan the forecasting has become more reliable.